Diane lives in a small hilltop castle in central Alberta, Canada surrounded by a forest inhabited by gnomes, fairies, a princess, and a dragon. Diane has a journalism diploma and an advanced diploma from the Institute of Children's Literature in Connecticut. The author is also an artist, art teacher, children books editor, international short story judge, and writing instructor. The author's The Pen Pieyu Adventures series has won ten international book awards and one provincial award. Diane Mae Robinson interviewed by Lian at I Read What Your Write. 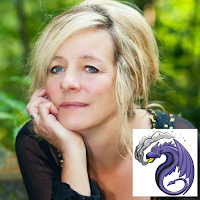 Snarls, the dragon, gets an interview at Kids Lit Reviews. It's the only truly fantastic world there is! Thanks for dropping by Banu, and your kind words. Peace and grace be with you also.